Heatran has seen a major decrease in success in the VGC 2018 format due to the popularity of Intimidate Incineroar which means Heatran sadly doesn't enjoy the success it had in 2013 and 2015 as it's lost its spot as the premier fire type in VGC anymore, but I wanna make the case that the Lava Dome Pokemon still has a strong niche in the 2018 format and can still provide a strong role for a few reasons. Heatran was a Pokemon that was decently popular during January and February that was a common pick for certain teams. Standard Mega Kangaskhan teams enjoyed Heatran due to how well it worked back in 2015 thanks to its typing and bulk, Mega Gyarados teams like the one Alex Gomez used at Leipzig Regionals enjoyed it since they also ran Tapu Bulu due to its Grassy terrain helping out Heatran's ground weakness, and even Mega Salamence teams used Heatran due to how their types can synergize which is important. When Incineroar was given its Intimidate ability in a PokeBank giveaway, Heatran was shown the door and many players dropped Heatran in favor of Incineroar due to how Incineroar can do most things Heatran wants to do such as having a better match-up against the Mega Metagross / Tapu Lele duo. Incineroar gave more teams Intimidate + Fake Out which is important for teams, as well as a dark type which is always great for teams as the Dark typing, can deal with Pokemon with the Prankster ability like Whimsicott and Thundurus-I. This is a sample set for Heatran that I highly recommend, that was originally built by my Michigan player Alex Collins (@nerdofnowVGC). The reason I recommend using the Shuca Berry item is that its the most relevant item for Heatran thanks to how popular Ground-type moves are. Stomping Tantrum from Mega Meatagross and Earthquake or Earth Power from Landorus-Therian are the most common ones it has to deal with which means being able to survive it is important. Moves-wise, your big fire type option is either Heat Wave or Flamethrower. Heat Wave is a strong fire type spread move which is great for damaging your opponent, but Flamethrower is great as it bypasses Wide Guard and allows the Heatran to survive Stomping Tantrum from Mega Metagross and then KO in return with Flamethrower. The second option is either Flash Cannon for a strong steel type move which is great for hitting steel types like Tapu Lele and Mimikyu for super-effective damage, or Substitute which is great to increase the longevity for your Heatran by making it harder to KO. If you go with Substitute, giving Heatran Leftovers can still be a good idea for regaining the health lost from setting up that Sub. Earth Power is the final move, which is great for threatening Pokemon like Tapu Koko and others like Pokemon like Tyranitar and Mega Charizard X that can easily switch-in to your fire type moves. Firium Z is great mainly because it takes advantage of Heatran's naturally high base 130 Sp. Attack stat which allows it to abuse its strongest Fire-type move in Overheat to threaten a KO or major damage on Pokemon like Cresselia and Landorus-Therian who can fall to Z-Overheat in one shot. Choice Scarf will be discussed later as to why its a great item but in short, you can use Hidden Power [Ice] on your Heatran to outspeed Landorus thanks to the Choice Scarf and threaten a KO. The Assault Vest variants of Landorus will survive your attack, but the others will fall in one shot which is great information to know in a Best of 3 scenarios since item choice is very important information to have on your opponent. One thing Heatran does great is walling out most of the fire types in the game. The big one in Incineroar only beats Heatran should it run Low Kick which only appears on 42.19% of all Incineroar on both Pokemon Showdown and Battle Spot. What this means is roughly 4/10 of all Heatran will be able to threaten Heatran and the ones that lack Low Kick will only threaten with Knock Off which doesn't become as threatening without the item intact while Heatran can threaten with more damage with Earth Power which is on 95.53% of all Heatran. This is great because it allows the user to more consistently threaten with the vastly more popular super-effective attack. Heatran also can wall both Mega Evolutions of Charizard which is great because of its Flash Fire ability which means it's fire type attacks are useless and Mega Charizard Y's 2nd attack in Solar Beam does very little to Heatran. The only attack that Mega Charizard Y can threaten with is Hidden Power [Ground] whose usage is only at 5.83% which means the matchup heavily favors Charizard. Mega Charizard X, on the other hand, can threaten with Thunder Punch which is on 24.54% of all Charizard which although the matchup still favors Heatran, Mega Charizard X still has a neutral move to hit Heatran. Other fire types such as Volcarona struggles due to its fire and bug type attacks being rendered useless to cause any meaningful damage while Blacephalon doesn't fare well due to its very weak defensive stats but can at least damage Heatran with Shadow Ball. The only common fire type that can threaten Heatran is Blaziken thanks to being part Fighting-type so it can damage Heatran for super-effective damage. Cresselia has long been a favorite partner for Heatran for many years. 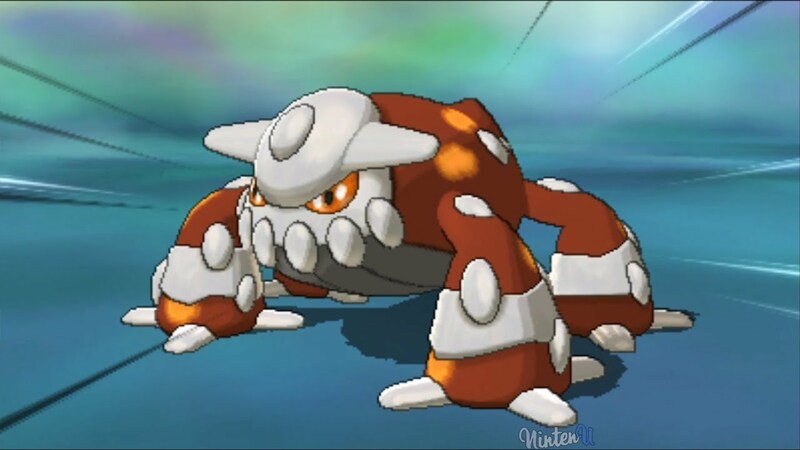 A common idea most players had was to either use Sunny Day to increase the power of Heatran's fire type attacks, which during 2013 when Heatran got access to Eruption through an event, was a popular idea, or use Skill Swap to give Heatran the Levitate ability which is great because it eliminates its 4x weakness to Ground-type attacks. A newer partner, Tapu Fini's role as the most popular water type in the 2018 format means Tapu Fini is able to threaten the Ground-types that threaten Heatran like Landorus-Therian or something like High Horsepower from Snorlax. In return, Heatran can deal with the poison, electric, and grass types that can hit Tapu Fini for super-effective damage thanks to its typing and moves it chooses to use. Another new partner, Tapu Bulu's ability in Grassy Surge, which reduces the power of Earthquake which is amazing for Heatran since it can help with its 4x weakness to Ground-type attacks with the very common move in Earthquake. Do note that Grassy Terrain does not weaken Stomping Tantrum. Heatran can help out Tapu Bulu thanks to typing synergy as Tapu Bulu's weaknesses to Ice, Fire, Poison, and Flying are all covered by Heatran. Ever since Landorus-Therian came onto the scene, it's been Heatran biggest issue. Its Ground typing combined with an impressive 145 base Attack stat means even through the Shuca Berry, Heatran might still fall to either Earthquake or even a Tectonic Rage. Some Heatran has responded by dropping the berry in favor of Choice Scarf and use Hidden Power [Ice] to deal with Landorus, but the Assault Vest variants will live it and KO with Earthquake. Rain has always been an issue for Fire-types due to how the rain weakens the power of fire type attacks while strengthening water type moves. What makes Rain teams especially scary for Heatran is they commonly run at least 2 water types, the rain setter, and the rain sweeper. Water Types - Other water types such as Tapu Fini, Milotic, and Azumarill can heavily threaten Heatran. Tapu Fini and Milotic are very bulky Pokemon that can take multiple hits and threaten back with either Scald or Muddy Water. Azumarill doesn't take much damage and can easily use Belly Drum to fire back with a +6 Aqua Jet that will surely KO very easily. As explained throughout this article, Heatran excels mainly at having a very strong matchup against most of the Fire-types in the format due to not being affected by their main attacks. A good defensive and offensive typing in Fire/Steel and great offensive stats allow Heatran to still be a strong Pokemon. If you can justify Heatran on your team as your Fire-type, then it can be in contention for your team's MVP.